Those who have been reading along know of the the fondness the New England Spahtens have for Rob Butler and his Shale Hill Adventure obstacle course in Benson, VT, and the races held there. 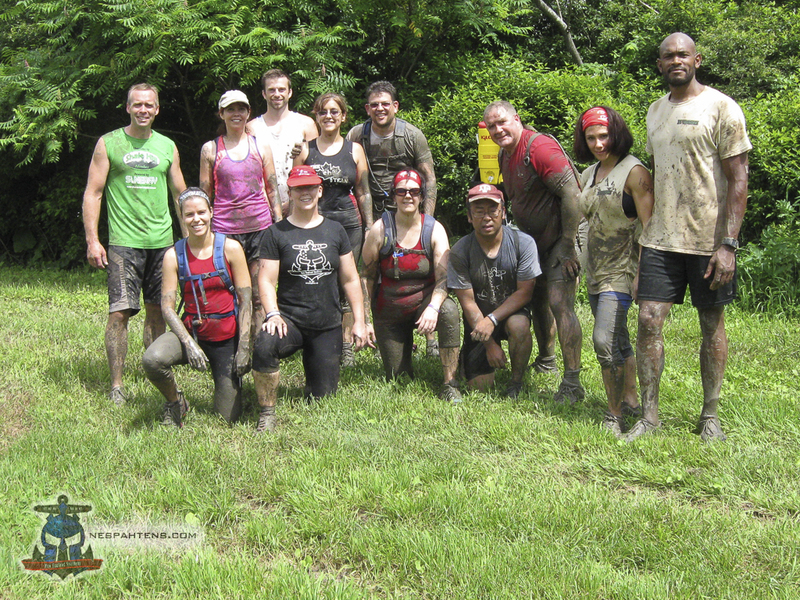 The weekend of July 6-7 introduced a new facet to the Shale Hill experience: the inaugural Shale Hill Obstacle Racing Camp. Here are the brochure-style details: 2 days, 9 a.m. to 2 p.m. each day … open to all skill levels (beginner, intermediate, advanced) … individual and small-group training and instruction, led by Rob Butler, Jason Moss, Heather Powell, and Randy Feeley … mud, water, scrapes, cuts, bruises, exhaustion (i.e., the usual). Lodging and food are not included, but inexpensive lodging is located in nearby Rutland, VT, and there was always water, Gatorade, and fruit available for us at the barn. The first day started off at the barn with a group meeting and introductory session. It was there we all met each other—10 in all (with the Spahtens being represented by Sandy Rhee, Vince Rhee, and Tom Kelly) plus instructors Rob, Jason, Heather, and Randy. I’d describe our group as squarely in the high-beginner to intermediate level, as everyone had races under their belts (in fact, a large chunk had just raced the Spartan Super in Montreal the weekend before). 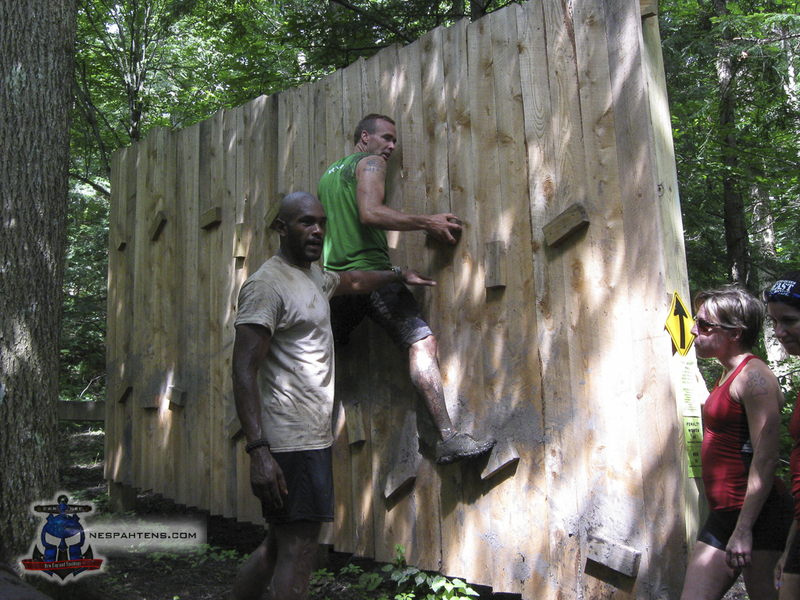 Special attention was paid to the highlighted obstacles, as these (or similar) obstacles are standard fare at your typical obstacle race. Led by Rob, the instructors would talk through a recommended approach, then run through it themselves, then have the rest of us go through it one or more times. When you think “OCR training”, this is probably what comes to mind, and I think we came away with more than our fill. After lunch, we went out to the grass track, and it was Randy’s turn. (For those who don’t know, Randy is pretty much the king of Shale Hill’s races right now…) For the next hour or so, we were treated to a crash course in his thoughts and approaches to the actual running part of a race, from striding to breathing to pacing. The group was then put to work, first learning about and running a “miracle mile” to use as a baseline for our later post-Shale Hill running endeavors, before progressing to a series of sprints to put into practice the concepts of increasing your pace. And with that, the official portion of Saturday’s activities was completed; a handful of people went out to individual obstacles to get some more practice, while the remainder went home for the day. Sunday morning saw us down one participant (Tom, who could only make it for the Saturday session) and one instructor (Randy, ditto). Whereas Saturday was all about the obstacles, Sunday was almost all about the conditioning aspect. The morning session started off with what Rob called “Crazy Eights”: Flip tires for an eighth of a mile around the grass track, then sprint an eighth of a mile… where you got to throw largish rocks for an eighth of a mile, then another eighth of a mile sprint… where you then got to flip an even heavier tire for an eighth of a mile, then another eighth of a mile sprint… finally ending with a sled drag for an eighth of a mile… oh, and another eighth of a mile sprint. Then it was Jason’s turn. The group met out at the Log Carry section of the Shale Hill course, where we set about carrying a decent-sized log around the carry loop. But no, not just carry… carry, then carry while doing overhead lunges (holding the log straight over your head), then more straight carry, then burpees with the logs, then more straight carry, then broad jumps (with the logs racked), and finally multiple sets of flutterkicks (holding the log overhead) and pushups before at last relinquishing the logs. Back to the barn for lunch, where Rob held court with his opinions on shoes: what to look for, what works, what doesn’t, all in his very informed opinion. 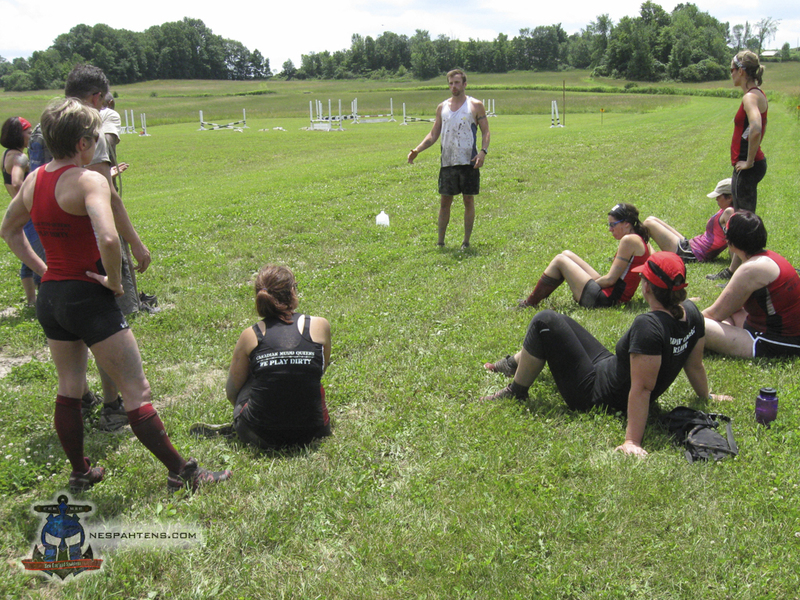 After lunch, it was on to Heather, who led us through an entire conditioning workout (mostly body-weight exercises) that (a) was specifically useful for OCR-type training, and (b) could be done by anyone at home without the need for specialized equipment. After this, it was back outside for a followup session on the rope climb and wall climb obstacles. Then back up to the barn for a closing motivational speech by Jason, some closing remarks by Rob, and with that, our weekend at Shale Hill was over. Pacing, especially on Saturday. While going through the course during the morning was both useful and a treat, things got a little rushed towards the end. This can be chalked up to it being the first time actually going through this with a “live” group, plus the varying makeup of the group itself. For larger groups, however, this could be more of an issue than it was for us. Though the weekend was advertised as being for all skill levels, the actual content and activities as presented may be a little much for a rank amateur. Given that the makeup of our particular group ranged more towards the intermediate level, this wasn’t too big of an issue, but a wet-behind-the-ears beginner would likely benefit from a “scaled-down” presentation of the activities. 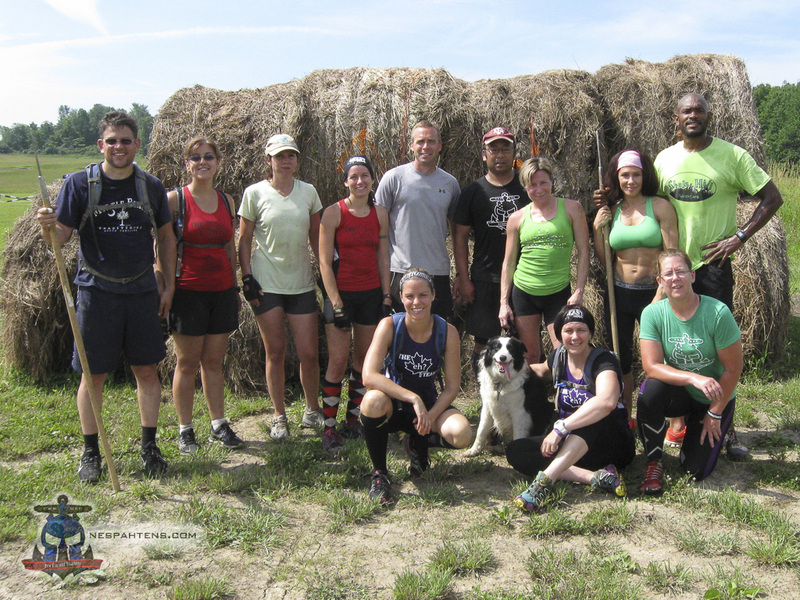 At $100 for a weekend of OCR-specific training, the approach and content at Shale Hill should fit right in with any serious obstacle racer, especially those who already have the bug and are looking for that little edge to push them to the next level. Some of it may be old hat to veteran racers, but even for them, the opportunity to learn and practice for a weekend in a controlled, non-race environment should not be overlooked. And again, this was the first OCR training session formally held by Shale Hill, so it should only get better as some of the edges get smoothed out. You should check it out! Love Shale Hill … Wanted to make it to this, but it was not to be.